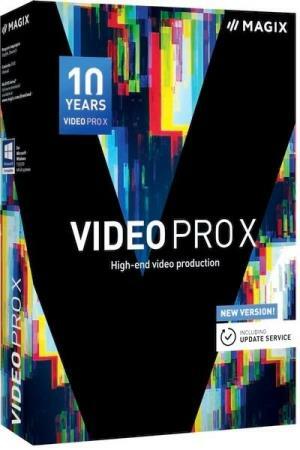 MAGIX Video Pro X10 - идеальное решение для редактирования видео. Программа специально разработана с учетом самых сложных требований амбициозных и профессиональных пользователей. Она была победителем всевозможных конкурсов и содержит набор инструментов, предназначенный для глубокой обработки видео и аудио. Помимо прочего, разработчики пришли к максимальной эффективности при работе с помощью разбивки программы на модули. Многолетний опыт разработчиков обещает пользователю великолепные звук и картинку. Tap into the full potential of your CPU and GPU! Now possible for the very first time thanks to NVENC support from NVIDIA and AVX-optimized algorithms. The full power of Video Pro X — unleashed! The feature requested most by the Video Pro X community is now available in the anniversary edition: HEVC/H.265 video export with CUDA support from NVIDIA. By outsourcing exports to the encoder on your NVIDIA GPU, video export can now be performed faster than you ever thought possible. The biggest leap in Video Pro X performance in years. The next boost in performance: CPU utilization. Video Pro X's comprehensive AVX optimizations for internal image processing and 3-way color correction make image processing much faster, deliver much more precise output quality on color conversions and free up resources for the use of additional effects. Output quality 4K Full HD Less sparkle and fewer Moiré patterns when playing 4K source videos in Full HD. The latest edition of Video Pro X significantly reduces image artifacts during the compression of high-resolution videos. The solution: reducing the high-frequency portions of the image. A new smart home for Video Pro X's effects range: bigger, better and equipped with the latest technology. Effects from previous versions are now much more precise and versatile, while new high-performance effects are now possible for the very first time. It works! Object extraction Exactly like you'd imagine. Video Pro X's new object extraction algorithm makes it possible to recognize and extract objects from videos. Plus, the reliable antispill feature for removing green edges can now also be used in template mode. Chroma keying at its best! We work directly with professional Video Pro X users to improve performance and functionality and achieve a truly perfect workflow. The latest developments to come out of this process are the new time-saving J-L cut and the intuitive "Move object content" mouse mode. The new, flexible grouping options for video and audio tracks. Tracks can now be modified individually without losing the advantages of working with grouping. The new J-L cut — an impressive time-saver for overlapping objects such as spoken audio which spans several scenes in documentaries and interviews. Modify individual sections of your movie scenes directly in the video objects that contain them to achieve a perfectly edited movie. The video object itself doesn't need to be modified in any way. This lets you continue editing without affecting your rhythm, and the intuitive controls help save tons of time. Modify and expand your video projects anytime and add tracks to any position even at a later stage. Breathe life into your videos with new ideas or make them more exciting or modern.